Pamper yourself on your Wedding Day. Adrienne and Sinead are the perfect duo for your wedding day. Email: [email protected] [email protected]. Sinead is a mobile hairstylist specialising in upstyles for your wedding day. Established hairdresser, trained by top Irish Hairdresser Aidan Fitzgerald. Formerly a member of his team of expert hairdressers. 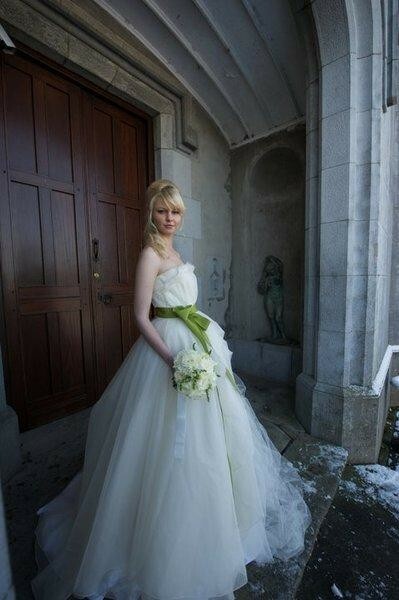 She has been featured in Confetti Magazine and has also worked the Irish Bride Magazine awards. Sinead also worked on a Kinnitty Castle photoshoot for B Magazine. Adrienne is a freelance Make-up Artist who specialises in natural Wedding Make-up, which will last for the whole day. She does pre-consultations (over 1 hour), travels to Bride's home on morning of wedding and covers most of Ireland. We do pre-consultations and travel to brides home on morning of wedding. We cover most of Ireland. "We like to feel that we put Brides at ease on the morning of their wedding and have a nice calming influence on Bridal Party." A Bride's wedding day is one of the most special days in her life and we want to make sure we play a role in making her look and feel a million dollars. Sinead is an amazing, talented, friendly stylist. From the very first trial I felt she was extremely knowledgeable about all types of hair (I have very curly hair). She is not only a great hairdresser but she is also a lovely person- just the kind of person you need on your wedding day. My bridesmaids and myself loved our hairstyles. I would highly recommend Sinead! Sinead was so friendly and had the perfect balance of listening to what each of the bridal party wanted whilst taking the initiative to produce something amazing! We were all delighted with our hair dos and she was a great addition to our morning getting ready. Thank you Sinead for doing such an amazing job on my hair, I can't over how amazing it went, at our trial and even better on the day. Everyone complimented me on my hair. You are a true professional and know exactly how to work with all types of hair (I was super nervous, as I have very curly hair), but you made my curls look incredible and my whole style was natural, true to me, yet elegant and dressy for my wedding day. I also found that you listened to me and what I wanted, as I found other stylists to be pushy and not listening when I said, I have curly hair and want to keep my styling to a minimum. I appreciate your professionalism and also flexibility so much, when creating a wedding style. It was so much fun and effortless! I would say to anyone that comes across your page, to seriously consider Sinead as your wedding stylist, for your big day - you won't be disappointed! Sinead did a great job with our hair. Everyone looked great and it was all done on time. She was also pleasant to have around, very friendly and chatty. She seemed to know exactly what we wanted done with our hair, even where we couldn't describe it too well ourselves. Sinèad made our wedding morning! She put everyone at ease and let her talent do the talking. I'd highly recommend her. Sinead was incredible. My hair was fabulous. She listened to what I wanted and was able to produce a number of great styles. She arrived on the day in plenty of time to do all my bridesmaids. She was such a lovely person to have around in the morning as well - all smiles. I would completely recommend her to any brides. I couldn’t have been happier with the service Sinead provided, styling the hair for six of us for our event. She completely understood how each of us wanted our hair to be styled and it was one of the best blowdrys I’ve had in recent memory! She arrived early and is naturally friendly and relaxed, putting us all instantly at ease. Thanks again, Sinead. Everyone told me how important it was to make sure that the weddding morning was relaxed and fun-having Sinead there made it just that and so much more! As my ratings above show, in the lead up she was professional, flexible,and ever patient, never too busy for a quick chat about hair accessories or height of up do! She has the unique skill of bringing a sense of calm and craic on your wedding morning-creating a feel of a girls pampering morning, certainly getting rid of any nerves that might exist! I absolutely loved my wedding hair as did my bridesmaids and mum, aswell of course did the girl of the moment, my flower girl!! I chose Sinead due to the fantastic recommendation of a friend of mine who was a bridesmaid at a wedding and had had her hair done by her. Sineads skill coupled with her warm personality, make her stand above so many others in my opinion. Friends have gone on to use her saying the exact same. Wonderful memories of the perfect start to the day, coupled with a very happy bridal party make thehairmob the easiest decision you’ll make! Sinead was a dream to have around the morning of the wedding, she was very easy going and chilled but managed to get through us all in good time. She even fixed my dads hair. My niece had never had her hair done before but sinead was so kind and lovely, my niece loved the end product! I'm a little late getting around to this review but I would 100% recommend Sinead (The Hair Mob) as a wedding hair stylist. She was excellent to deal with from start to finish. She was very responsive to mails and very accommodating when it came to arranging my hair trial. She went through a number of different styles during my trial and nothing was too much trouble. She was a dream on the morning of the wedding. She was very organised but good fun and put everyone at ease. She did the hair for my friend's wedding (I was bridesmaid) so I knew she would be great and was definitely not disappointed. Sinead was an absolute dream to deal with - arranged a trial in her house and had a rough idea of what I wanted but Sinead worked with me and tried a few things until we got it right and then on the day achieved over and above our original design Sinead travelled to our venue that am and worked her magic even on my little niece who wanted to style her own hair!! So friendly nice easy going and so nice to work with - would highly recommend her. Sinead Gaffney of The Hair Mob was the perfect choice for mine and my Bridal Party's hair styles on our Big Day. Having tight curly hair myself, the thoughts of what to do on the day were quite daunting, but from the day I had my trial with Sinead, all my worries went clean out the window. She showed me several different styles that I could have happily had for my wedding day and was great with tips and advice on accessories, colour and products along the way too. Sinead didn't allow any of us to leave for church that morning until she was happy that our hair was perfect and would stay that way for the whole day and it did just that. I was truly delighted with my final look on the day, as were my three bridesmaids and my Mam. Sinead's easy-going demeanour was also a hugely calming influence on us all on the morning. I would highly recommend the Hair Mob to any Brides to Be. Sinead was my hair stylist for my wedding. I had a mini disaster when my original hair stylist pulled out 4 weeks before the wedding but luckily Sinead was recommended by a friend and she was free on the right day. I have never been so happy to be let down before as Sinead was just wonderful. She was so easy to work with and so accommodating for hair trials in the run up. On the day she was professional and calm with 7 people to do and flew through them all. She gave everyone exactly what they wanted and nothing moved out of place until bed at 4 in the morning. Personally my hair has never had such volume and she knew exactly the right style to suit my face. I’d have no hesitation is recommending her for any occasion but especially weddings as they can be so frantic and she is so relaxed and efficient. Thanks a million Sinead. Sinead was fantastic to work with, so easy and professional. I was planning my wedding from the UK and it was another weight off my mind to know that I could completely trust Sinead with my hair on my big day. The whole bridal party were delighted with the end result and I would highly recommend Sinead to anyone looking for quality and great value hair styling. Thank you Sinead you were fantastic! Sinéad Gaffney is extremely professional, reliable and efficient. She has styled my hair on 3 occasions, twice as bridesmaid and once as a bride. She also styled 2 of my bridesmaids hair on their wedding days. Sinéad is so easy to work with. She is warm and great fun but above all an excellent hairdresser who is willing to listen to what the bride wants. I'd have no hesitation in recommending her to any future bride. Sinead thank you so much for helping to make the morning of our wedding run so smoothly. I would not hesitate to recommend Sinead to any future brides. She was so professional and so easy to work with and would not let anyone leave until their hair was perfect. She even tamed my dad's hair!!!! My hair lasted well into the next day and everyone admired it. Thanks a million. After reading Ciara's review I felt I had to write one too. I got married almost ten years ago and Sinead did my hair. She did an amazing job. Not only is she a brilliant hairdresser but she actually listens to what you want. Not only have I used Sinead as a hairdresser for weddings and other special occasions since my wedding but so have my family and friends - some have even used her for their own wedding. I would highly recommend Sinead. I had Sinead do my hair for my wedding last April. She was so lovely from the start and really helpful at the hair trial, trying lots of different options and discussing what style would go best with my dress. She was so calming relaxed on the morning of the wedding and it was lovely having her there. I really loved my hair on the day too. I would definitely recommend her to anyone. Sinead was amazing. She is so calm and relaxed and nothing was too much trouble. It feels like you have known her for years! She fitted in so well with everyone. Everyone was delighted with their hair and it lasted the day! I would highly recommend her. Sinead is an excellent wedding hairstylist who I would highly recommend. Myself and my bridesmaids were delighted with our hair on the day of my wedding. Sinead is very friendly and was very patient while I tried many styles at my trial. She is also very good value for money. Really great experience having Sinead as our hairdresser. At the hair trial she had some great ideas. On the wedding day she did an excellent job and really put me at ease on the day. Everyone was so happy with the results! I'd highly recommend Sinead if you're looking for a hairstylist for your wedding. She was professional, reliable, and punctual, and brought a real sense of calm to our morning as we got ready. I was delighted with my up-do, and it remained in place all day without any problems, even during dancing, and was very comfortable too. Same goes for my two bridesmaids' hairstyles, and my mum was delighted with her blow dry too. Thanks Sinead! Sinead was absolutely amazing. She was easy to deal with from the beginning and was responsive to messages which was great as we organised our wedding from Australia. She was really flexible when arranging the hair trial which was fab especially as it was so close to Christmas. On the day itself Sinead was so professional. She brought a lovely relaxed atmosphere to the house and fit right in with all the preparations on the day. I loved my hair and it lasted the whole day and well into the night. Thanks Sinead! Thank you so much to Sinead for her fab hairstyling on my wedding day. Having had my hair done my Sinead previously when I was bridesmaid for my sister I knew I would be thrilled with the results for my own big day. From the initial trial to the finishing touches on the morning, Sinead did a wonderful job. She is so friendly and down to earth and knows exactly what she's doing. Couldn't ask for better on you wedding day. Of course I had to have Sinead do my hair for my wedding day. She was the hairstylist for my two sisters weddings and on both occasions she did a fantastic job. I loved my up styles as a bridesmaid. Sinead came to my house on the morning of our wedding bright and early. She had her work cut out for her as she had my hair plus 4 bridesmaids and my mam , so six people all together. Sinead is always so relaxed and chilled and a really great person to have around on your wedding day. I loved my hair for my wedding as did all of my bridesmaids and mam. We will definitely see Sinead for the next family wedding. She also does my hair on a regular basis now as before my wedding I hadn't gotten a few colours in that were just not quite right in other hair dressers, My hair was nearly multi coloured at my trial, however Sinead sorted this out for me before my wedding and now I always get her to do my hair colour. Sinead spends time with you at your hair trial and gives you loads of options I honestly truly would recommend her to all brides to be. Sinead did my hair and the hair of my bridal party on the morning of my wedding and I have to say it was everything I could have hoped for and more. At my trial we discussed the style of the wedding and tried various styles that I had been thinking of which meant on the morning of the wedding i felt nice and relaxed as Sinead knew exactly what I wanted. My hair still looked perfect that night even after some very enthusiastic dancing, I couldn't be any happier with her service! We had the pleasure of having Sinead do our bridal party's hair and Adrienne do our make-up on the morning of our wedding. Even though they had the extra task of having two brides instead of one this didn't phase them at all, in fact they took it in their stride, making both of us feel comfortable and relaxed. We loved the way our hair was styled and the make-up looked great too. We got loads of compliments about both. We would highly recommend both ladies. Thank you Sinead & Adrienne for a lovely morning!! Sinead was recommended to me by a friend and she was amazing! She is a talented hairdresser and listened to what we wanted. She was good fun on the morning too. Her many years of experience were a great help and she managed our schedule, keeping things moving well without creating any pressure for me or the bridesmaids. I can't recommend her highly enough! Sinead did all the hair for my bridal party. Her professionalism and friendly manner made me feel relaxed. She did spectacular upstyles for myself and my bridesmaid. She also did amazing curls and an up style for my flower girls. I would have no hesitation in recommending Sinead for your wedding day. Sinead has always been my hairdresser and continues to do my hair on a regular basis. I first met Sinead on my wedding day, a nervous day for most but I have to say she put both myself and my wife at ease. She really made the day special, I’ve never felt so glamours. I highly recommend Sinead, she’s extremely professional, and just an absolutely lovely person. I felt the need to write this review as I chose The Hair Mob because of the great reviews and I was disappointed. On the morning there were 6 of us getting our hair done. One blowdry, two beautiful half up half down hairstyles that the girls loved and three that didn’t quite work out. I have short hair so felt limited with what I could do with my hair. I chose curls. The first time Sinead did my hair I started to panic because it was not what I wanted and it made me look much older. I didn’t want to seem demanding but it was my wedding day so I had to say I did not like it. Sinead worked on it a bit longer and it still wasn’t what I wanted. It was only after the bridesmaids had their say Sinead used a curling wand which surely should have been used at the beginning. I was just happy that it was finally what I wanted. My biggest disappointment was that Sinead didn’t re do the hairspray for me. The time difference between doing my hair and her leaving the house was about 1.5 hours. This resulted in the front of my hair going straight almost immediately after my ceremony. I had to pin my hair back! One of the girls had a bob. She wanted a wave and not curls and was told that wasn’t possible so it was just blow dried which is not what she wanted. The last girl explained that when her hair is curled it goes limp very quickly. When Sinead did her hair she felt it was a bit ‘Irish dancing like’. We agreed we would let it drop a little and then redo it. Sinead never went back to this girl. Sinead was lovely and did a great job on the upstyles. I first met with Sinead about a month before I married for a trial run, myself and 3 bridesmaids. I went in saying I want my hair curly. Sinead duly blow dried my hair curly and it was lovely she then suggested an up style which I was a bit dubious about as I have always worn my hair down. Wow what a difference all the girls loved it - so it was decided my hair was going up for The Day. On the day in question everyone was commenting on how much younger it made me look and also the bridesmaids looked great as well with their up styles. On another note from the first night I met Sinead she was great fun, totally professional and nothing was a problem for her to do she also had some great suggestions for all the bridesmaids regarding when to get their colour done and when to have it trimmed etc . On the day of the wedding Sinead arrived at the appointed time, set to work immediately and nothing was a problem, I asked her could she then do a blow dry for a friend who had come from the country and it was no problem. Sinead made me feel totally relaxed on the day as she was so professional in doing her job. I can genuinely say I would have complete confidence in recommending Sinead and I know that if I have any further weddings /big functions etc it will be Sinead I will be calling on . The minute I spoke to Sinead I knew she would be great on the day I was so happy to have her round the morning of our wedding even recommend our make up artist too. The morning arrives and Sinead was there early and put me so at ease even though I didn't have a trial My hair was absolutely stunning on the day as well as my bridesmaids hair and mother in laws blowdry. Everyone complimented our hairs on the day I have recommended Sinead to loads of future brides. Sinead was absolutely amazing, she did my hair my sister and mum. Not only is she very talented but was so much fun on the day and really added to our morning getting ready. I highly recommend Sinead!! Sinead at The Hair Mob has been styling hair for many years and it really shows in her work. She does such lovely, intricate styles that look highly professional. Not a single hair is ever astray! On the morning of the Wedding she had to style 5 ladies' hair (3 bridesmaids, mother of the bride, and my own), so she came in nice and early to my hotel and styled us all in under 4 hours. She was so lovely and calming on the day, in spite of the minor setbacks we were experiencing with the day itself. The hair styles looked amazing and we all felt like celebrities for the day! I also had a practice styling with Sinead a few weeks prior to the wedding, where Sinead tried on a few of the styles that I suggested. She was very helpful with showing what could work best in terms of what I wanted. At the end of it, once I had picked the one I liked the most, I was so excited to have her style my hair on the Wedding day because it looked perfect! As a bonus, the hair curls, that I slept in, lasted perfectly for over 24h - something that no other hair dresser had ever been able to achieve, as my hair doesn't ever stay curly beyond a couple of hours. The main reason as to why I wanted a hair stylist that works independently rather than as part of a salon, was that you are guaranteed that any review or any photos of hair styles belong to the hair stylist you are interested in. With hair salons, it was almost impossible to know which styles were done by which stylist, or which reviews belonged to them. But with The Hair Mob, you can clearly see her work. I will be getting in touch with Sinead again for future special occasions! My sister had booked Sinead from The Hair Mob to do her hair and her bridesmaids (of which I was one) for her wedding back in December 2014. She did such a great job that I didn't hesitate in looking to book her to do my hair, and my sisters, for my own wedding in July 2016. My hair was done beautifully and exactly how I wanted it, and I know my sisters were also delighted with their hair on the day too. Sinead was highly professional and so easy to deal with. She is also has a great fun personality and really made the morning of my wedding relaxed and enjoyable - it really was a pleasure to have Sinead there. I would have absolutely no hesitation in recommending her to any bride-to-be. I booked the Hair Mob for the bridal party's hair and make-up on the morning of our wedding as they would travel to Carlow, and I was very happy that I did as both Sinead and Adrienne were fantastic. I had a trial with Sinead a couple of months before the wedding. She was very flexible and so friendly, nothing was too much work and I had a good idea of what I wanted by the end of the trial. On the morning of the wedding, she was there early and got everyone done with lots of time to spare, even putting last minute flowers in all our hair! We were all really happy with how our hair turned out, mine still looked great at 5am! Sinead and Adrienne (Make-up artist) were both wonderful at keeping us relaxed on the morning. I'd highly recommend Sinead and Adrienne for both hair and make-up as they were both excellent. I was so happy when Sinead from the Hair Mob was available for our wedding day. We arranged everything over email as we live abroad, she was very quick to respond to emails and nothing was ever a problem. She took her time doing my trial, when it suited me as we were back so close to the wedding date. The morning of the wedding she was punctual and ready for us when we needed her. She was relaxed and got everyone done on time. She truly did a remarkable job with all our hair and I would highly recommend her. Sinead was the perfect hairdresser for my wedding ! She made 3/4 different styles during the trial, catching very well my (vague) explanations. She treats your hair as if it was hers, very soft hands. I was quite nervous about the choice of my hairdresser because the pictures I found on internet or on hairdresser websites didn't match with what I wanted, meaning something quite natural, with some flowers. But based on a simple picture, Sinead managed during the trial to create the style I wanted and that would nicely compliment my makeup and wedding dress. On the day, Sinead managed to do the hair of my bridal party and friends, 9 or 10 persons if I remember well, still being very flexible and relax. My hair style was even more beautiful than during the trial. Merci Sinead, i would give you even more than 5 stars on Weddingonline if I could ! Sinead was my hairdresser for our wedding & she was excellent apart from her creativity with our hair, her smile & sense of humour on the day made her service even more special. She had a diverse amount of people to deal with from 80 year olds to a 2 year old! We all looked great & the thought she put into each of us was just 100% - I highly recommend her to everyone!! I booked Sinead to do my hair for my wedding last year after reading so many positive recommendations online. Initially, I wasn’t sure exactly what I wanted for the wedding and that’s why I found the trial to be so helpful. Sinead tried up styles, half up styles, curly and straight until we decided together what suited me best. I was thrilled with the end result, which Sinead recreated beautifully for the wedding. Sinead is an extremely professional hairdresser, as well as a lovely person who is very easy to get along with. I recommended Sinead to my sister for her wedding, and she too was delighted with the results. Sinead is now my regular hairdresser, and I would highly recommend her to anybody. Sinead was my hairstylist for my wedding last year in 2015. She did a trial first with me in her house and tried various styles until I was happy with my decision. She is such a lovely warm person that it was a very easy decision to go with her for the big day. 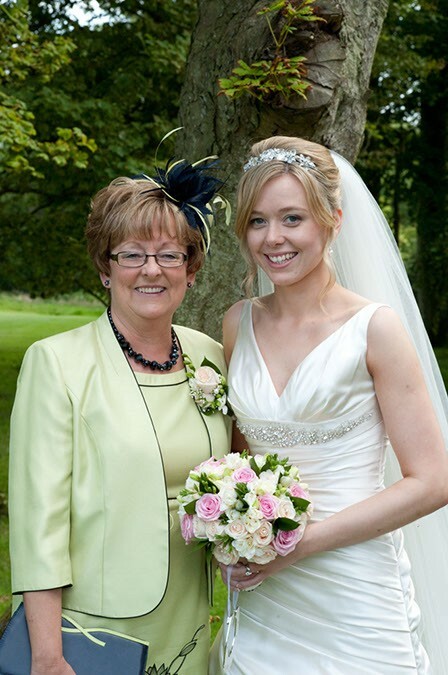 She did hair for myself, 4 bridesmaids, my Mam and my Auntie all in good time before going to the ceremony. My hair didn't budge all day and it was quite windy for photographs. Sinead has now been doing myself and my Mam's cuts and colours for more than a year since the wedding. I really could not fault her at all on her professionalism, experience and value for money. I booked Sinead from Australia for my wedding in June. Only five days married but I am dying to tell everyone about her service.From the first email she was great and I am so glad I found her. The hair trail was great fun and she was like a friend of the family. Nothing was too much trouble, even the morning of the wedding I still had not decided on a style for my bridesmaids and she looked at the dresses and did a up style that everyone loved! She even calmed us all down when we had a bridesmaid malfunction and we could say she saved the morning from turning into panic! Hairstyles were all amazing.The whole bridal party would like to thank her and I know the family will always recommend her to friends in the future. Thanks Sinead. Sinead was so professional!! She called around to my house & did a trial upstyle, she did as many styles as I wanted & said if I wasn’t happy, she would call around another evening to do my hair again. I was really happy with what she did, so no need for her to come for another trail run. The morning of the wedding she called to the house early & did my hair first. It was even better than what I wanted, I was so happy with my hair. She did my mums hair, 3 of my sisters hair & my daughters hair. Sinead made us feel at ease & was so nice to chat too. I’ve recommended Sinead to a few of my friends. She is amazing at what she does!! I booked Sinead as my wedding hair stylist through email as we live in Australia, from initial contact she was so quick to respond and so friendly and helpful! I felt like is was in good hands. I did my hair trial with Sinead and she trialled my bridesmaids hairstyle on me as well which was fantastic as it was all perfect. Sinead came to our hotel to do our hair on the morning of the wedding which was so convenient and just made things so much simpler on the big morning! I was delighted with my hair and with my bridesmaids and both styles lasted all day! I wouldn't hesitate to recommend Sinead to anyone, she is fantastic, so professional and so easy going. She is so easy to get on with and we all had good fun getting ready on the morning! Thanks again Sinead! After my friend had a disaster of a trial for her wedding I went online and found Sinéad and I'm so glad I did. She put my friend at ease during her trial where she spent a few hours until they agreed on the perfect hairstyle. Sinead did all our hairs for the wedding and they were all fab and lasted all day. So when it came to my wedding there was no question who I would book, I booked Sinéad early and we did a trial and found my perfect hairstyle. She did 4 hairstyles on the day (bride, 2 bridesmaids and mother of bride) and we were all thrilled with the look. As well as being extremely talented Sinéad is a lovely down to earth girl who listens to what you wants and then does her magic, thoroughly recommend her to any bride. Sinead was wonderful from the first contact I made with her to check her availability for my big day. She is so friendly and easy going and on the morning of the wedding she really put us all at ease. It was a pleasure to have her there at such a special time. My trial was fantastic and Sinead tried as many styles as I wanted - she made me feel like we had all day! As for the hair on the day, I absolutely loved it and it lasted until I finally hit the bed in the early hours! My mam and sister also looked amazing. Sinead was so lovely to deal with from the first time I contacted her and right through until I was leaving for the church on the morning of our wedding. My hair trial was in Sinead's house a few weeks prior to our Wedding, she spent hours doing different styles in my hair so I could get an Idea of what I wanted on the day and when both my sister and I left our house that evening we felt like we'd known her years! I was delighted with my hair, which was a complicated upstyle that Sinead had finished in well infer an hour. My 4 bridesmaid and Mam all had their hair done by Sinead and they where all very happy with how they looked on the day. I highly recommend the hair mob and I look forward to Sinead doing my hair again at some stage in the future! I would recommend The Hair Mob very highly for bridal hairstyling. Sinead was so lovely to deal with, I had a great trial with her where we tried lots of different styles until I was completely happy. On the big day she was very professional while at the same time being great fun to have around and myself and my bridesmaids were delighted with our hair and many people commented on the gorgeous hairstyles. Thanks Sinead! Booked Sinead at the Hair Mob for my wedding back in 2013, extremely friendly, professional & most importantly very flexible to lots & lots of last minute changes of plan. She went above & beyond on the day & helped rescue my morning from becoming a total disaster ! She even looked after a few of my guests who had been left high & dry to due to the extremely bad weather.myself & my bridesmaids were delighted with our hairstyles. I would highly recommend Sinead hence the 5 star review cause I seriously cannot fault her & continue to use Sinead as my hairdresser to this day. Sinead of The Hair Mob was fantastic. Highly recommended! I had the pleasure of having Sinead and Adrienne do hair and make up for my wedding on Oct 10th. I couldn't have been happier with the results! The hair Sinead did was exquisite and looked exactly the same at 2am! Super nice and talented girl and a total pleasure to deal with. Adrienne's makeup was fantastic. We were all thrilled with the resilts. Like our hair, our make up lasted all day and night! Highly recommend these two amazing girls. Sinead and Adrienne arrived into our home and made the start of our special day loads of fun. They work and compliment each other, making both hair and make up work for each person. They are both very professional, yet we all felt so comfortable and managed to have plenty of fun along the way. The four of us left for the wedding feeling amazingly confident, got loads of compliments, and thoroughly enjoyed our day. I booked Sinead to do my bridal party hair for my wedding on 30th August 2013, having been recommended by a friend. Myself and 2 bridesmaids spent a lovely Saturday afternoon in May with Sinead trying out different styles until we agreed on the final look for each of us. She was brilliant, very friendly and had loads of great ideas. I have long curly hair so was a little unsure of what would suit me - I knew I wanted an upstyle but that was about it! I was really pleased with my look, as she came up with it based on the shape of the back of my dress and it really did look amazing on the day. On the wedding day itself she was great, working away at 5 of us, as we had agreed - 4 upstyles and a curly blow dry. Then she also did my page boy and flower girl, which were sprung on her at the last minute! Sinead is brilliant for her flexibility in that regard. Also, just to add, I got a second day out of my own upstyle - It still looked brilliant, and didn't have the heart to un-pin it!! I would highly recommend Sinead. Thanks again Sinead! We attended a wedding in June in the Castleknock Hotel Dublin. We travelled from Cork for this wedding and we wanted to get our hair and make up done without the stress of being under pressure for time.They came to the hotel which was brilliant. I came across Sinead and Adrienne on the internet and I booked them from reading the testimonials alone.They were absolutely fantastic and I would recommend them to anyone whether they are part of the bridal party or not. The atmosphere alone while all 5 of us were getting our hair and make-up done was fantastic and it really put us in a great mood for the day. These ladies are the the best out there. Thanks again girls...we had a briliant time!!! I got married in December and booked Sinead and Adrienne to do the hair and makeup on the day. We live in Australia and were organising the wedding from here. From the initial contact by email Sinead and Adrienne were so easy to deal with. They both spent ages at my trial trying different types of hairstyles and makeup. Sinead even did my hair for me at the end of the trial as I was going out to dinner that night. On the day they were fantastic, very easy going, friendly and efficient. They definitely helped to make getting ready on the day very relaxing. My bridesmaids, my Mum and I were all very happy at how beautiful Sinead and Adrienne made us look. I would highly recommend booking the girls for your wedding. I got married in November. Adrienne did my make up and Sinead did my hair. What a winning combination! I would without hesitation recommend both ladies for their patience, professionalism and personalities. Makeup and hair were exactly what I wanted even though I didn't have much of an idea what I did want. Adrienne and Sinead will advise on the looks that suit best but won't push anything on you that you're not comfortable with. My two sisters were bridesmaids and I have never seen them looking better. On top of all that we had the best laugh and had a really relaxing time getting on the day itself - so much so that I think it really set the tone for the day. These ladies really are a class act. You won't find better. Adrienne and Sinead, thanks so much for making the day so special for me. I want to say a huge thanks to both Adrienne & Sinead for making our day extra special with the fabulous hair and flawless make-up. They were so calm and easy going which made the day so relaxed for us all. Both our hair and make-up lasted the whole day and we got endless compliments on how great we looked. We definitely recommend choosing Sinead and Adrienne for your special day. Adrienne did a perfect job on my make up for my wedding day. The colours she choose suited my skin tone and the make up lasted the whole day. On our trial session she gave me lots of advice and tried lots of things with me before I was happy with what we were going to do. She was so friendly and helpful with all my ideas and choices. My bridesmaid was quite fussy with her make up and Adrienne was great with her, really calm and generous with her time and alot of back and forth about what would suit her! Adrienne was fantastic in my parents house on the morning of the wedding too, keeping everyone in good spirits and my mom calm! She is an amazing make up artist and a lovely person, I would highly recommend her for anyone's wedding day make up! Sinead was amazing, so relaxed and friendly. She couldn't have been more helpful at the trial session she did for me in my house, she spent lots of time listening to what I wanted and she really helped me decide what kind of style to go for for my wedding day. She knew exactly what would suit me and what I would like!The morning of the wedding was great, she fitted in perfectly to all the madness in my parents house and was very helpful with keeping everyone calm! She did my hair and 1 bridesmaid and they were perfect all day. I would only recommend Sinead to do hair for anyone on their wedding day, she is so lovely and a fantastic hairdresser! girls and brides to be i simply CANNOT rave enough bout sinead gaffney who did my wedding april 1st!!! she is amazing!! a joy to have around you on your big morning!! made my bridesmaids and mam so special and we were all beautiful with our fab hairstyles when she was all done!! so reasonable and a pure darling!!! dont look anywhere else book sinead!! she was fab at trial as well and gave great ideas!!! sinead u rock!!! Sinead and Adrienne are fantastic! Our hair and make-up was exactly as we wished for and we have received so many compliments on how we looked. On top of this, Sinead's sewing skills helped us to avert a mini-disaster when there was a small mishap with my Mum's outfit! It meant so much to be so happy with our hair and make-up, I would have no hesitation in recommending Adrienne and Sinead to anyone. I cannot recommend both Adrienne and Sinead highly enough! Right from the first time I met them both at my trials, they immediately put me at ease. They listened to my requests and delivered exactly the styles I had in mind. Sinead offered so many fantastic hair styles that I had too much choice, any one I picked would have been perfect. Adrienne did such an amazing job with my make-up that I didn't recognise myself! Both myself, my mother and my two bridesmaids were delighted with the make-up she did and did not need to worry about it all day, it stayed perfect with no need for touch ups. And most importantly of all, coming from the most nervous and self conscious bride of all time, I cannot thank them enough for how they made me feel on the morning of the wedding. They were the first people I saw and as soon as they arrived I changed from a nervous, jibbering wreck into a human being again, they chatted and laughed with me and completely put me at ease, and I was able to start enjoying my day. Thank you both again for how you made me look and feel, you gave me self confidence that I didn't think I could ever possibly feel. Adrienne did an amzing job on myself, my 2 bridesmaids and mother of the bride. She was a pleasure to have around the morning of my wedding. We all left the house feeling a million dollars. Makeup was lovely, really natural. Thanks again Adrienne. Adrienne did my makeup for my wedding in august 2005, i can highly recommend her !! she did a fanastic job on me and my bridemaid and even got my very reluctant mum to wear makeup and to look a million dollars !! what i really liked about adrienne is that she listened to exactly what i wanted and there was no hassle or fuss. thank you adrienne . 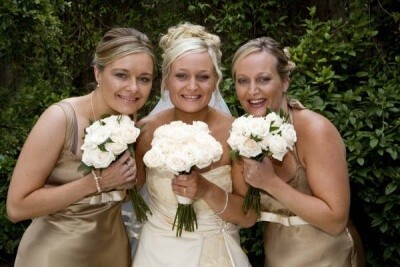 Having met both Sinead and Adrienne for trials before my wedding I felt so relaxed with them on the day. They came to my house the morning of the wedding and immediately put me at ease. As we had previously discussed the style that I wanted there was absolutely no hassle on the day and no fuss. My hair and make up was so natural and I have to say, they made me look so beautiful which is a testament to their skills! I didn’t have to touch my make up the entire day (from 11:30am till 4am) and my hair looked beautiful even late into the evening, albeit slight disheveled from all the dancing! 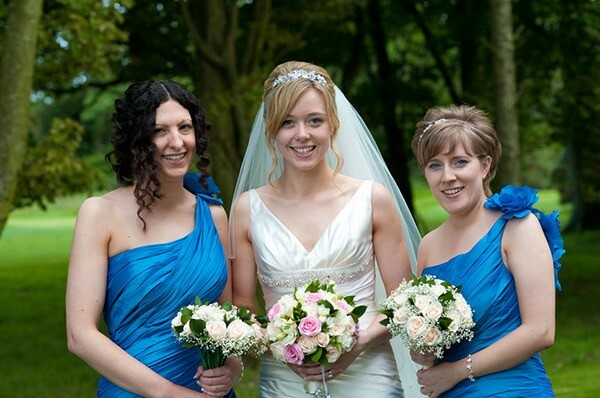 They were both lovely to deal with, my two bridesmaids thought they were fantastic and were really happy with their makeup and hair as well and looked beautiful all day long. All in all, very happy customers! The reason why I chose both Sinead & Adrienne for my wedding day is because not only do they work so well as a team together but they are fantastic people to be helping out on your special day. They both did such an incredible job on the day that I would highly recommend them to anyone looking for a hair and make up artist. So much so, that they are both going to do my sisters wedding also. The simple ideas I gave them on the style I wanted was completely followed through along with their advice. Not only did they have me looking beautiful but also my entire family as well. Sinead and Adrienne are true professionals, and not only did they do an amazing job on my make up and hair but I feel I will always turn to them whenever an event will take place to rely on getting my hair and make up done to perfection. What a lovely woman with such a wonderful personality and a very professional service. Adrienne was my make up artist last year for my wedding and i would highly recommend her. We had so much fun that day and the make up was spectacular. Even my mother was thrilled and she doesn't even wear the slightest bit of make up. We all felt a million dollars and Adrienne really joined in in the craic that morning! !